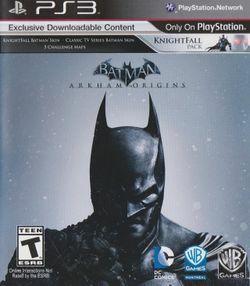 Batman: Arkham Origins is a 2013 action-adventure video game developed by Warner Bros. Games Montreal and released by Warner Bros. Interactive Entertainment for Microsoft Windows and the PlayStation 3, Wii U and Xbox 360 video game consoles. Based on the DC Comics superhero Batman, it is the successor to the 2011 video game Batman: Arkham City and is the third main installment in the Batman: Arkham series. It was released worldwide on October 25, 2013. The game, played from a third-person perspective, focuses on Batman's combat and stealth abilities, detective skills, and gadgets for combat and exploration. Aside from the main story, Batman can help the police deal with crimes, and confront other supervillains terrorizing the city. Arkham Origins introduces the ability for Batman to virtually recreate crimes, allowing him to investigate the scene and identify the culprit. The game is the first in the series with multiplayer capability. Warner Bros. Games Montreal took over development duties for Arkham Origins from series creators Rocksteady Studios. This page was last edited on 6 December 2016, at 13:34.